I love to hike. Planting myself in a hiker’s paradise has afforded me unlimited opportunities to satisfy my love for hiking. In reality, it hasn’t worked out quite the way I anticipated. First of all, I have too many interests and too little time to fulfill all of them. Family responsibilities top my priority list, especially in the fall when our grandchildren seem to be their busiest. Hiking takes a backseat so I can help with the grandkids. 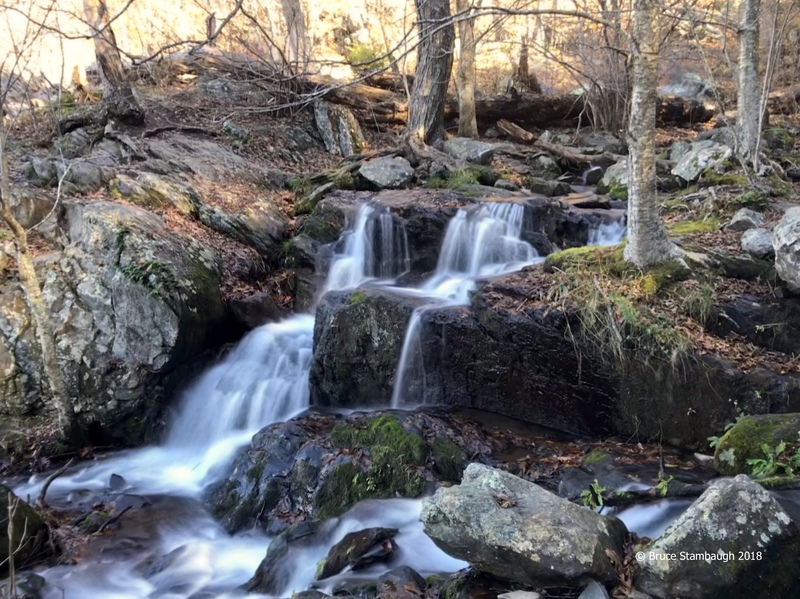 When I do get a chance to head to the many trails of Shenandoah National Park, I usually go alone. I enjoy the oneness with nature and the precious personal time to think and explore at my own pace. However, that lone ranger approach to hiking changed when I discovered a peer-hiking group. When an outing on a trail I had not yet tackled was offered, I wanted to go. However, I hesitated for somewhat personal reasons. Despite my doubts, I sent the confirmation email that I would join the group. I was greatly relieved when I got the reply. The leader welcomed me into the hiking circle. He volunteered that the trek would accommodate all the hikers’ needs. In other words, the group would stop as often as necessary. I was glad about that news, but now a new set of insecurities surfaced. I didn’t know how many people would be in the group. I didn’t know their level of hiking expertise. Nevertheless, I didn’t let my petty, irrational fears deter me, and prepared for the hike. I loaded my hiking gear, the hiking poles I had purchased but never used, my camera, binoculars, and a light lunch. I dressed in several layers of clothing to peel off as the day warmed. Our group was small, only five, all of us retired with various levels of hiking proficiency. The other four hikers were as pleasant as could be. We each enjoyed the camaraderie that ensued along the way. Our revered leader knew all aspects of the park, its botany, geology, and history. His genial personality served him well. The day was crisp, the forest quiet except for an occasional gusty wind that rustled the still green leaves. I was surprised at how very few birds I saw or heard. 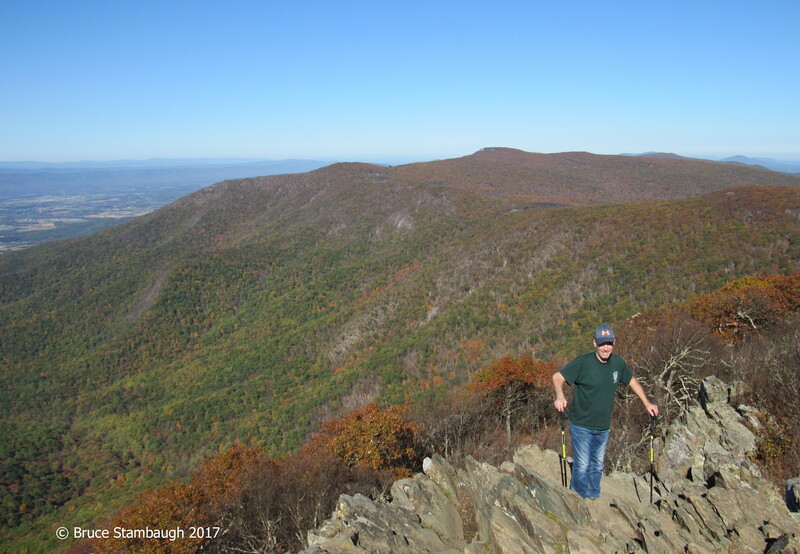 We followed the Appalachian Trail up the ridge on sometimes rocky, steep terrain, sometimes mostly flat, well-worn earth. Short grasses and fallen leaves bordered the trail. We ate our lunch standing and sitting on ancient igneous outcroppings overlooking the sweeping valley below. 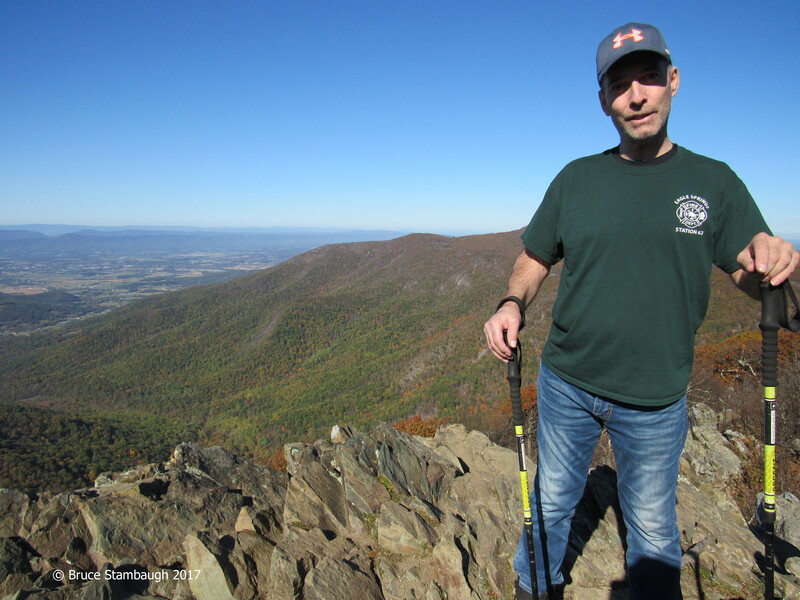 Signal Knob, the northern-most point of the Massanutten Range, stood across the way overlooking the old-aged Shenandoah River. After lunch, we crossed back over the AT, scrambled around and down another rocky point to view a rare exposure of basalt columnar jointing. Seeing the hexagonal formation dispelled once and for all any remnants of my silly fears. It had been a glorious day hiking with newfound friends. Naturally, all of my fears proved to be unfounded. In this age of fear-mongering and extreme reactionary phobias, it was a timely reminder for me. Trivial or not, tell your fears to take a hike before they walk all over you. 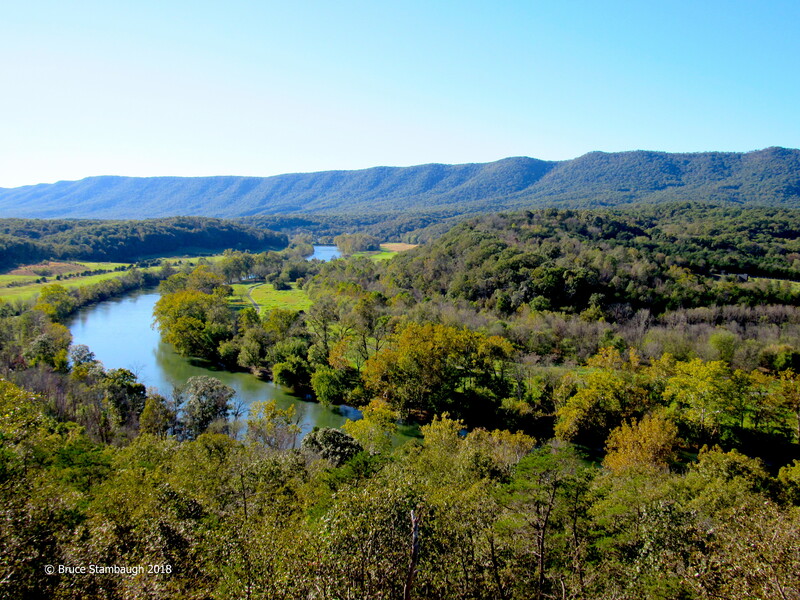 Overlook at Shenandoah River State Park. When is a chimney more than a chimney? The memorial chimney at Elkton, VA. When is a chimney more than a chimney? I know that sounds like a strange question. The answer, however, might even be more so. A chimney is more than a chimney when it no longer serves as a chimney. Now, I know you must be really confused. I can gladly explain. 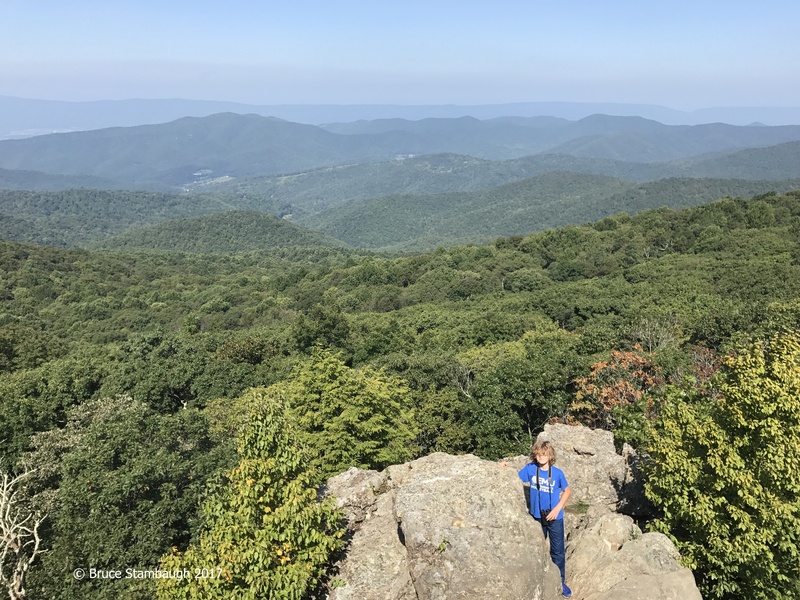 When the Shenandoah National Park was first being conceived decades ago, hundreds of folks lived and farmed the land along the mountain ridges where the park was to be formed. They would have to move to make the park a reality. That became an issue. In most cases, the government compensated landowners within the designated park boundaries for their property and buildings according to market value in the 1930s. Others received less than they thought they should. However, tenants operated many of the farms and received no reimbursement. Some of the displaced were resettled in nearby towns. Most were on their own, leaving behind fond, treasured memories and subsistent livelihoods. Adding insult to injury, many of the abandoned homes, having been condemned, were either burned or demolished in developing the new national park. For those displaced folks, more than walls went up in smoke. Year after year, families returned to where they used to live if only to view the ruins and pay their respects at nearby family cemeteries. In many cases, only the chimney of their former dwelling remained. 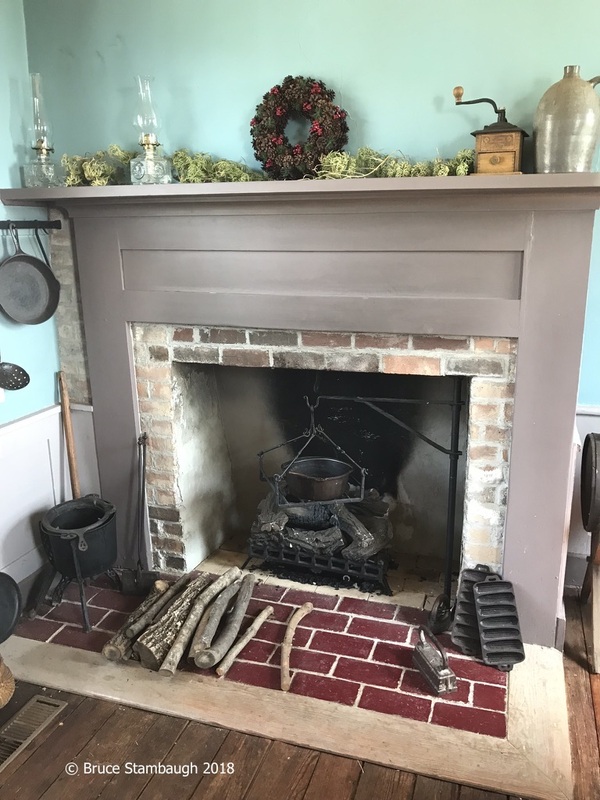 Memories of sitting by a warm fire in the dead of winter, of a mother preparing a family meal using the fireplace, and of looking up from working in the nearby garden and seeing smoke curling out of the chimney were all recalled. Together, the fireplace and the chimney served as the sources of survival. Knowing that resentment still lingered in local families after all these years, grassroots efforts were begun to help quell that ire. Local non- profit organizations, community volunteers, college students, descendants of those who were displaced, city, and county officials worked collaboratively on a memorial project. They decided to establish monuments in honor of those removed from the parkland. The chimney was chosen as the most logical symbol to memorialize those on the harsher side of the history of creating the park. To date, six memorials have been built. 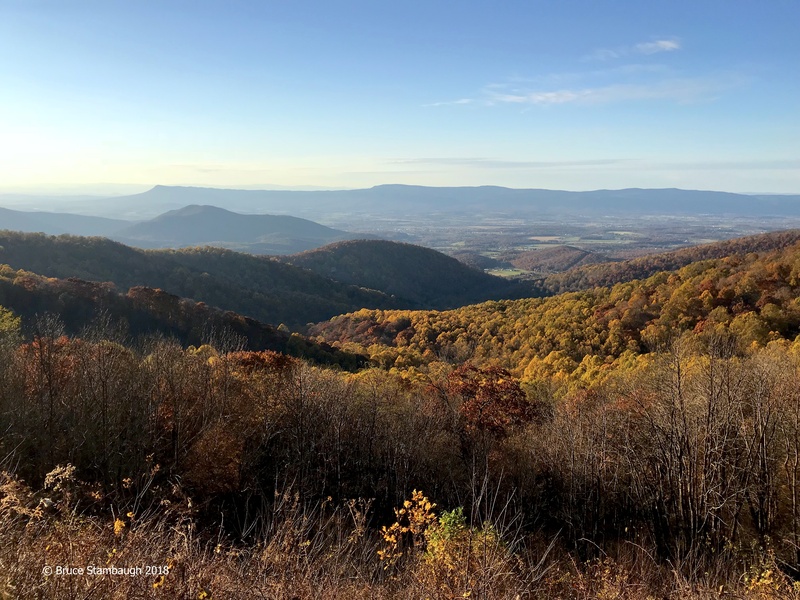 Two more are planned, which will complete the circuit of all eight counties that have land within the boundaries of Shenandoah National Park. The park owes its existence to its proximity to the populous East Coast. For its part, the National Park Service created an informative, inclusive and accurate exhibit of the history of Shenandoah National Park at the Byrd Visitors Center at Big Meadows. Chimneys play a prominent role in retelling that story. 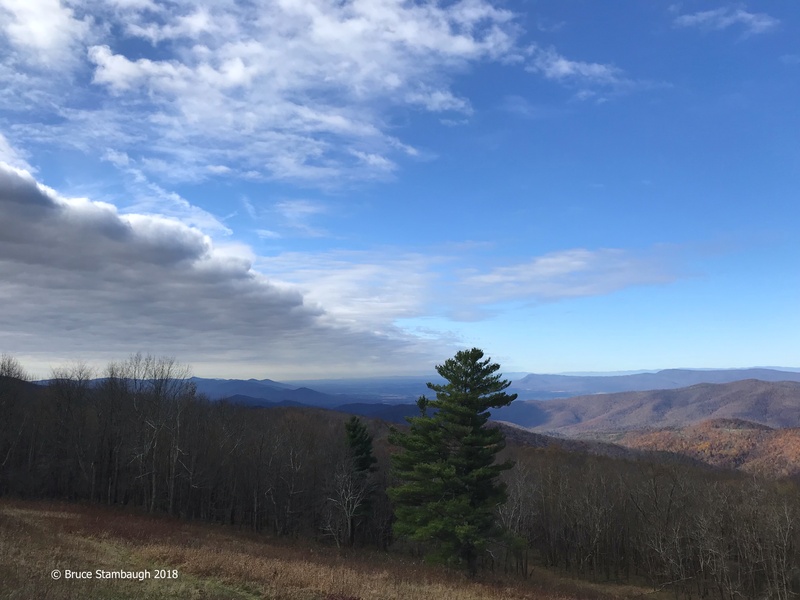 The latest of the chimney memorials was just dedicated in Rockingham County’s town of Elkton at the foot of the Blue Ridge Mountains where the Skyline Drive snakes through the park. 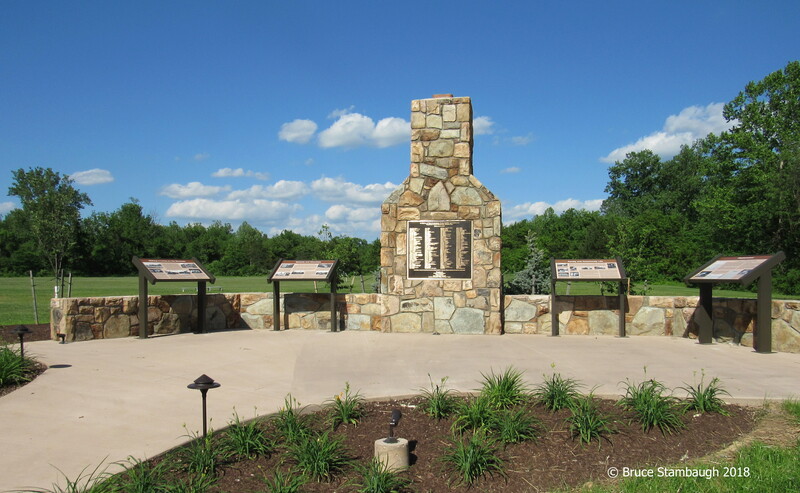 Volunteers built these chimney memorials using native limestone and granite rocks. I imagine a little blood, a lot of sweat, and tears of both sadness and joy flowed in the process. With the remaining people who were displaced now in the 90s, the memorials were built to keep the story alive through education about the park’s history, including its dark side. In truth, these chimney memorials serve a more significant, more admirable purpose. These chimneys also help heal those long-held hurts of personal injustices. When is a chimney more than a chimney? When it serves as both an emotional symbol of history’s good and evil that can’t be changed, only remembered and respected, and one that reconciles. 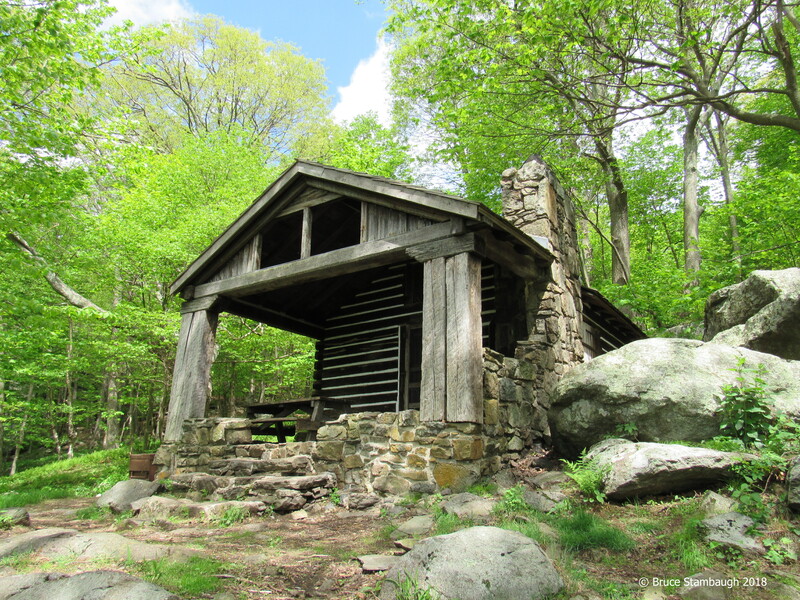 Ironically, this cabin, complete with a local stone chimney, was built by the National Park in 1936, after many of the original homes were destroyed. When I happened upon this scene yesterday, I had to stop for practical and aesthetic reasons. 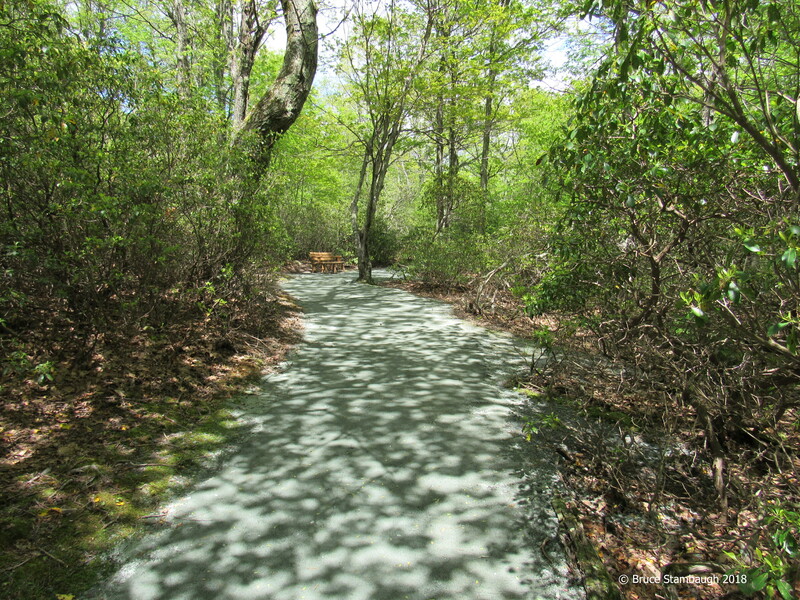 Crews were working on the Limberlost Trail in Shenandoah National Park. Recent heavy rains had washed out and badly rutted sections of the handicapped accessible trail. To avoid some of the construction at the trailhead, I walked the trail loop backward. As I rounded a curve near the trail’s end, I stopped. Because this spot was where the repair was being done, I wasn’t sure if I should proceed. No signs indicated that the trail was closed, however. The rolled, finely crushed limestone looked more like freshly-poured cement. Once my eyes adjusted to the canopy-filtered light, I realized that the speckles were nothing more than leaf shadows created by the intense afternoon sun. I thought the dappled effect stunningly artsy. “Patterned Path” is my Photo of the Week. The scene just blew me away. The afternoon sun highlighted every hue and tone of russet that Big Meadows had to offer. 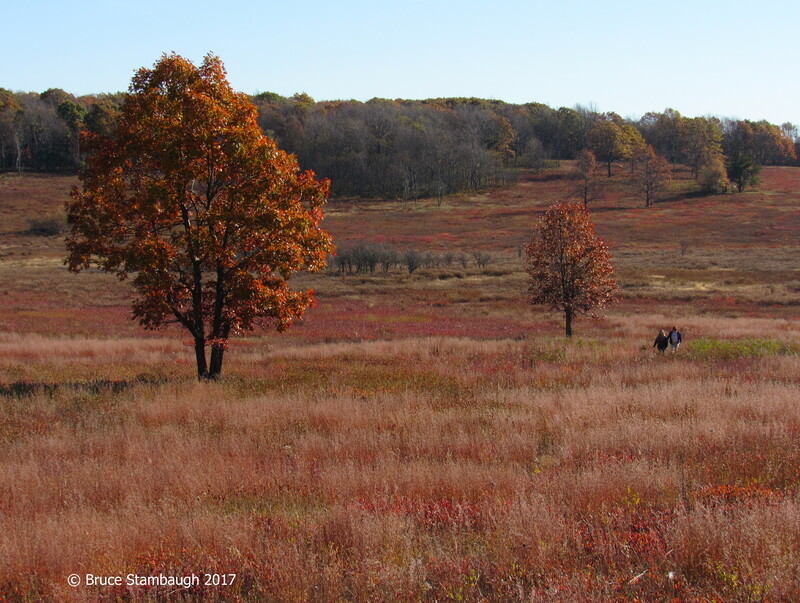 Grasses, leaves of wild blueberries, reeds, scrub oaks, and even the red oak trees all glowed some shade of reddish-brown. The subtle differences all blended together made an impressive sight. Big Meadows is a large mostly open bowl-shaped area along the Skyline Drive in Shenandoah National Park in Virginia. 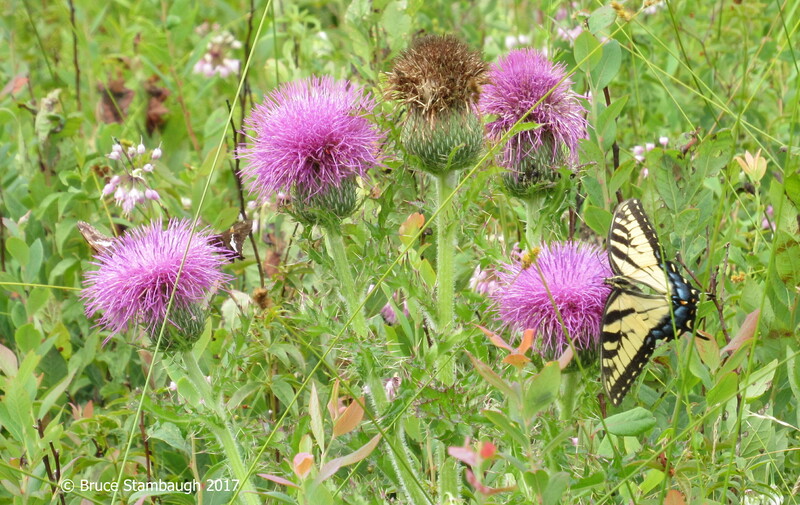 Surrounded by thousands of acres of hardwood forests, why this fantastic meadow is there is a mystery even to the park guides and scientists. I’m just glad it is. “Russet Rainbow” is my Photo of the Week. Click on the photo to get the full effect. We got the last space in the parking lot. 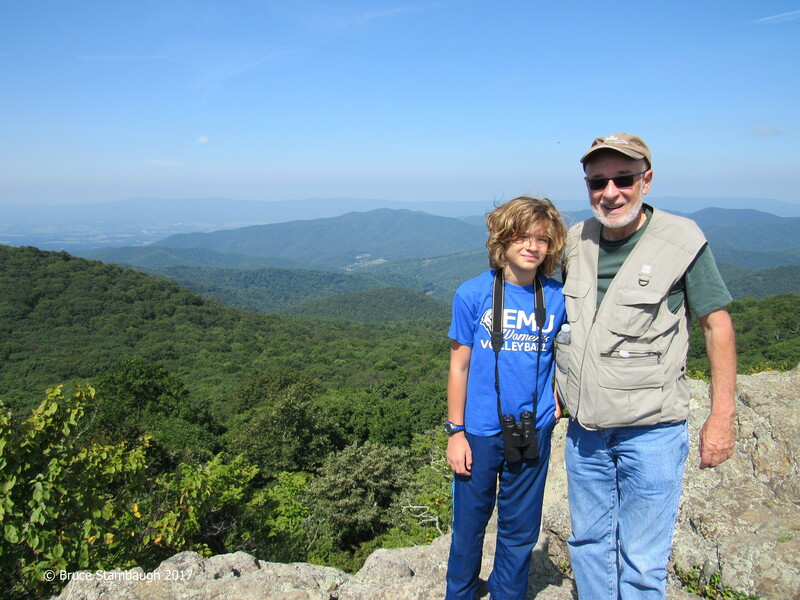 My 11-year-old grandson and I were beginning a hike in nearby Shenandoah National Park. We had trudged this trail with his entire family a couple of years ago. This time the two of us would do the trek on our own terms and in our own time. Clearly, though, we wouldn’t be alone. The warm sunshine and cool temperatures drew many others to hike in the perfect weather. I carried snacks and water in my multi-pocketed vest I mostly used for birding and photography. I packed extra batteries for my camera given my history of digitally documenting every step of the way. Davis carried the binoculars. Our ascent began as soon as we crossed the roadway. Soon we joined the Appalachian Trail that winds through the Blue Ridge Mountains. A stone marker with a metal band identified where our loop trail and the main trail split. We indeed encountered other hikers, some early birds who were on their way down, and others like ourselves who were ready for the rocky trail ahead. As we climbed, we always had to watch our step. The trail consisted of dirt, stones, terraced steps formed by exposed tree roots, and huge rocks. Ascending the summit of Bearfence Mountain is more of a rock scramble than it is a climb. For an 11-year-old, it was child’s play. For a creaky-boned, gimpy-kneed grandfather, it felt like survival. I struggled to pull myself up the jagged boulders that served as the ridge-top trail. Undulating, rocky outcroppings intermittently protruded above the surrounding forest of oaks, maples, sassafras, wild cherry, and dogwoods. Davis, on the other hand, bounded catlike up, down, and around the biggest boulders. Rectangular dabs of baby blue paint clearly pointed the way over the exposed bedrock and through narrow crevasses and the many trees. When I dallied, either to catch my breath or to take a photograph, Davis retreated to make sure I was keeping up. During an easier section of the trail, Davis surprised me with a hiking theory he had developed. He said a team of hikers required five different people. “You need a photographer,” he said, “who is last in the group because he or she is always taking pictures to document the trip.” I appreciated both his astute observation and his subtle hint at picking up the pace. A hiking team also needed an explorer to guide the group and who usually took the lead, he continued. I think he had found his calling. The other skilled positions included a writer to record and report about the trip once it is completed, a carrier to tote the equipment, and a collector who gathers samples to research after the expedition. I thought his comments both profound and practical. However, I quizzed him about the obvious. Weren’t the two of us already doing all of those tasks? 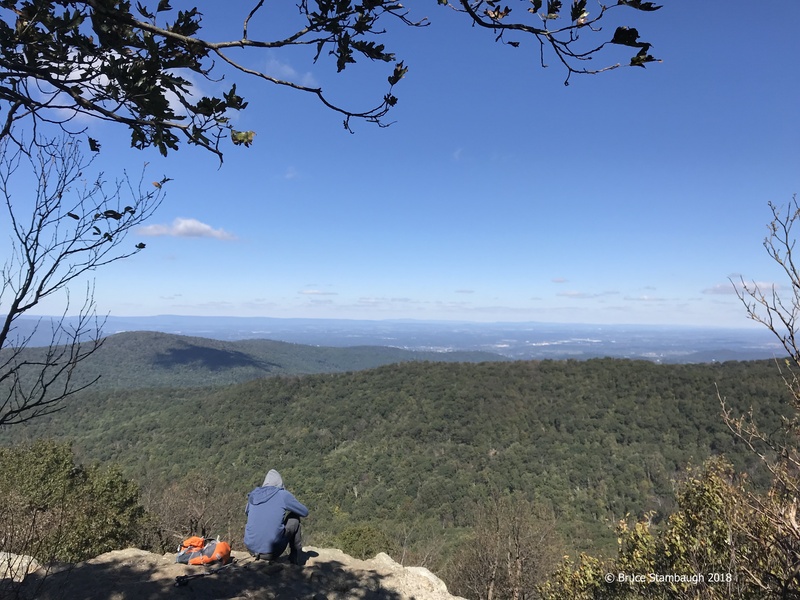 As we enjoyed the expansive views of the Shenandoah Valley to the west and ate our snacks, other hikers joined us. 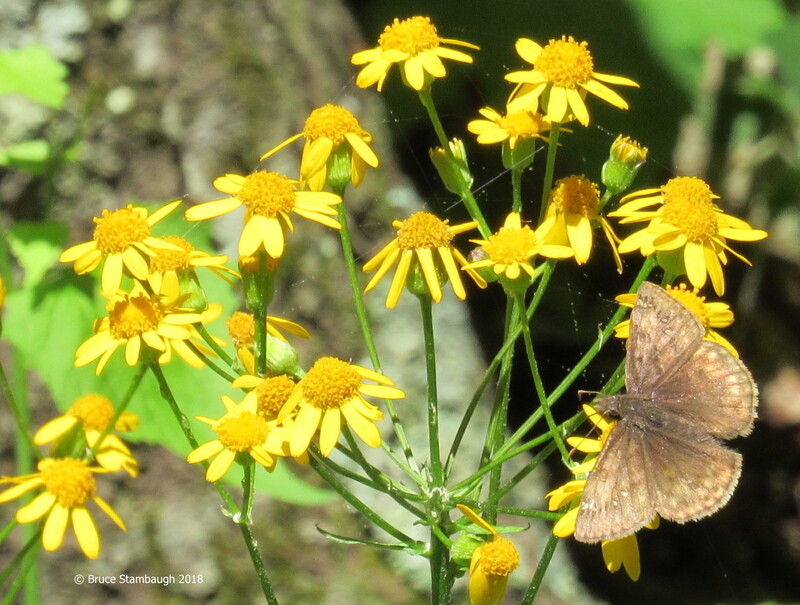 Butterflies danced in the forest openings and sunbathed on lichen-covered rocks bordered by wildflowers and bright berries. Davis, of course, kept practicing his hiking team concept by being the explorer. He disappeared and reappeared at will. I didn’t need to ask my grandson what he thought of the day. Davis’ enthusiasm spoke more ardently than any words could. He had enjoyed the outing as much as his pooped Poppy. The explorer and the photographer.